May 31, 2013 by Venky. Bike Fit? What Izzz Zat? Bike fit? What bike fit? You buy a bike, may be adjust the saddle height, heave your leg over it and start riding. If you don’t feel comfortable, you adjust the saddle height again, may be move it forwards or back and may be flip that stem too. Make one change at a time and ride some until you feel that you arrived at a right fit. If it is still not cutting it for you, there are tons of articles on the web and thousands of Youtube videos out there to show you what is a right setup. There are umpteen rules of thumb for each of your thumbs. So, what is the fuss all about? Why do you need a special someone(not that special someone!) who takes money from you to tell you what is right and what is not? It is not rocket science after all. That had been my view on the subject of bike fit. After riding a little over 40,000km in around 4 years on various bikes, I thought I knew a thing or two about what exactly is a good fit for myself. So, when I heard that my fellow TFNer and winner of TFN-2012 masters category, Bjorn Suetens of CyclePrecision, will be town to offer his professional bike fit services, I initially showed little interest. Iliotibial Band Syndrome:The Hell With You! However, when the ITB issue that put my running dreams to rest, reared its ugly head up on my bike, after what was an excellent time trial race for me this February, I had to reconsider my fit and what was going wrong. I scoured the internet for possible causes, readjusted my fit on feel and what I’ve read. Nothing seemed to help. I guess, the fact that my flexibility took a nose dive with very little stretching also didn’t help. I couldn’t help but observe that when I was regular with my yoga stretches, nothing usually hurt. So, my hypothesis is that the lack of stretching coupled with trying to push my performance limits seemed to exaggerate minor fit issues and began to dig up old injuries and throw new ones into the mix. With the mortal fear that this ITB issue might put me off my bike too and that I’m going to balloon up again into my old plump self, began to drive me crazy and I became obsessed with finding what’s wrong. My internet research hinted at wrong bike fit and more interestingly, limb length discrepancy. With the help of my skipper Arvind Bhateja, through a scan I was able to figure out that my left femur was 6mm longer than my right. This was resulting in my right hip dropping and subsequently resulting in the left ITB being stretched. It was decided that this was the root cause of the pain. I began consulting my team sponsor, Spectrum Physio, Dr. Dhananjayen to reduce the pain. His physio sessions helped a great deal in reducing the pain and making my rides pain free. While the pain was sorted, I still had to sort out the correct fit on my bikes so that this problem doesn’t recur. When I was considering all sorts of wedges to compensate for the leg length discrepancy with little knowledge of what would be the results, I was reminded that Bjorn Suetens was going to be in Bangalore. I couldn’t have asked for a better timing. I jumped on the chance and signed up for his bike fit session. I have attended the session on 1st April. I’ve spent a few hours with Bjorn while he worked on the bike fit for a couple of others along with me. He suggested a few changes like decreasing the saddle height and changing the cleat position etc. Although I felt immediately more comfortable on the bike, I wanted to observe for a few weeks of riding before forming an opinion on the session. It has been almost 2 months from the session and having observed the results of the bike fit session for myself and being pleasantly surprised what I happened to learn, I decided to do a review. He started with a heart to heart chat about my riding experiences, riding distances, riding goals etc., which are supposed to be factored into the fit that he’d suggest. Next up was a flexibility test where he spent time bending and stretching my limbs to gauge how flexible I’m, which muscle group is tighter and which is doing good etc. This information again was an input for his decisions on the right bike fit for me. Flexibility check.. Rider flexibility of course has a big say in the bike fit. So, he starts with it! Another interesting aspect that intrigued me was the kind of nuanced foot measurements he took to find not only the length and width of the foot but also the arch height and the slanting angles of the foot. Based on these measurements he inserted various things like cleat wedges, insole wedges(which are thick on one side and thin on the other to account for the slanting nature of foot) and arch support inserts. These changes apparently result in not only comfortable feet by minimizing unnecessary movement inside the shoe but also ensure efficient power from this very important contact point. I didn’t opt for the e-soles but the insole wedge he provided that goes under the sole in my shoe greatly helped reduce my big toe and ball of the foot moving up and down inside the shoe. The guys who tried the e-soles with arch support that I talked to on later rides said that they experienced initial discomfort and that it took a week or so of riding to get adjusted to the e-sole. Foot and arch measurements resulted in special e-sole inserts depending on the need. Another tool he extensively used was the goniometer to find out the angles of the legs and arms relative to torso and hip etc. These angles dictate vital things like the saddle height, stem length(reach) and saddle set back etc. Goniometer at work! 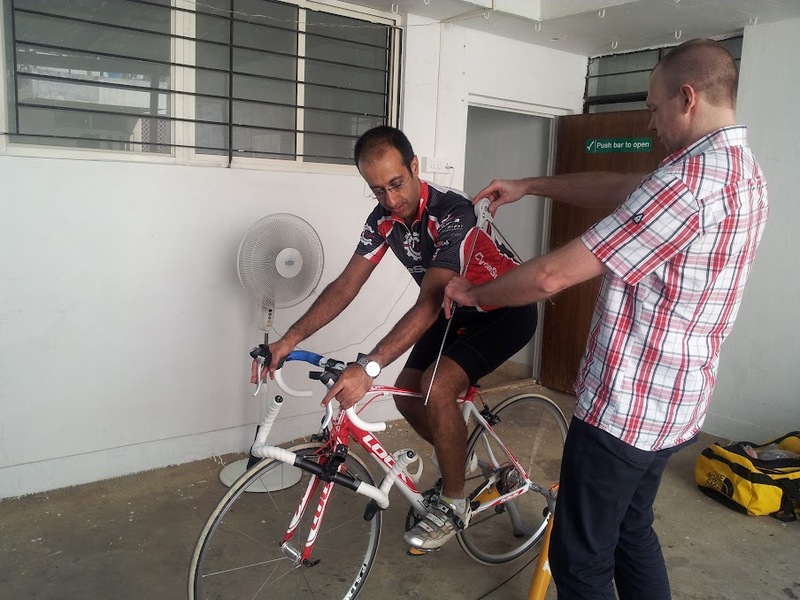 Santosh Dominick getting his saddle height sorted! One common thing that Bjorn observed with most of us here was how most of the riders were using mismatched handlebars(typically too wide). He made that observation with me right away after seeing the 44cm handlebars on my Lemond on our first ride together before last year’s TFN. After TFN, I took his advise and swapped my super wide bars with 40cm bars and it was a sea change in terms of balance of the bike and lack of discomfort during long riders. During the fit session, he suggested changes to handlebars where needed based on the shoulder width of the rider. He had a variable length stem on which he mounted handlebars of various widths for the riders to try during the fit session. Arvind Bhateja trying out narrow handle bars while Bjorn sorts out some angles! One more thing he looked at very minutely was how the knees were tracking during the pedaling motion. Based on this, he suggested changes to the cleat position as well as pedaling technique where needed. It was interesting to note the level of detail he went into while making changes to cleat position. He seemed to suggest cleat wedges for most to ensure even/flat foot position. He was also observing closely if the hips were rocking during pedaling. Laser precision! He was using a gadget that threw a laser beam to see if the knees tracked alright while pedaling. Once all the adjustments were made, he took all the vital measurements and documented then and there in an excel sheet and sent it for our future reference. The major changes he suggested for me were saddle height reduction by about 15mm and moving the cleats forward by almost 10mm so that the pedal axle is centered under the ball of the foot. Although he considered adding wedges under my cleats to compensate for the leg length discrepancy(LLD), he observed that there wasn’t any hip movement after the saddle was dropped and suggested that we refrain from doing anything to compensate for LLD. I was relieved that I didn’t need to do anything special for the rest of my cycling life to compensate for the LLD. The experience so far in the 2 months since the bike fit session has been very positive. The saddle height change meant that I’m not moving my hips sideways too much anymore and also not putting undue pressure my perineum. The result has been quite pleasing. I used to experience discomfort around perineum region not just after long rides but also after shorter hard rides. That has completely disappeared now. Although the fit session resulted in comfortable ride right from day one, the initial days after the changes were not that encouraging in terms of power. I could see that I was not able to generate the same power as before. It was disheartening but I knew that I have to be patient so that whatever new muscles are being engaged more due to the changes have to get used to the work load. So, I gave it time and worked my way up in terms of intensity. Now, I’m able ride hard without any issues and my sprint/out of saddle efforts got more zip with the cleat position change. Although I knew that having cleats more towards mid foot is likely to have a negative effect on the sprint, I felt the difference only after the change is made. Not that I’m a super strong sprinter now, but still there is a palpable difference when I get out of saddle. More importantly, the ITB issue didn’t come back. I’m now able to ride free of injury worries and am able to enjoy the rides better. I know it didn’t sound like a typical review of a product/service but this was my experience with the bike fit session from CyclePrecision. I’m quite pleased with the nice no-nonsense way Bjorn went about his job, the amount of time he spent and the kind of details he went into to get things just right. More importantly I’m quite pleased with the results that I got from the session. More photos from the fit session here. Nice writeup. The message is very clear – if anybody has serious issues, it's better they go for it. We are lucky that guys like bjorn are coming over here and heping us with such issues. Quite interesting. That mention about the wedge preventing the ball of the foot and big toe moving in the shoe, is something I feel often. Hmmmm… got me thinking. Nice write up. 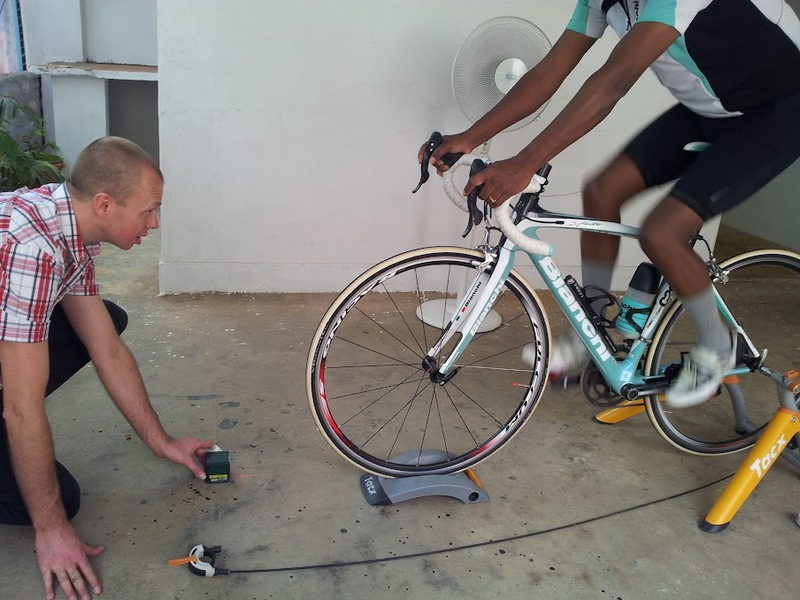 Was there any improvement in your average speed using the same before before and after the bike fit?